Tata Motors, the Indian can manufacturer, has filed 3 UDRP cases in recent months, and has lost two of them. First it was the incredible case of Harrier.com, which is a generic domain registered many moons ago. Tata Motors lost that UDRP with flying colors. Yesterday, we shared the news on TataCoin.com, a domain whose Chinese registrant claims it’s about cryptocurrency services in China – where crypto is getting a beating by the Chinese government. Tata Motors lost that case as well. Today, we examine the UDRP case of TataInvest.com – a domain in Indian hands. The latter is important, as Tata Motors is indeed famous in India, where it proclaims to have formed in 1917. The Respondent put together a templated web site claiming to be an investment company in India. The end result is seen below. The Complainant is Tata Sons Private Ltd. of Mumbai, India, represented by Anand & Anand, India. The Respondent is Registration Private, Domains By Proxy, LLC of Scottsdale, Arizona, United States of America / Kuntal Kamboj of Haryana, India. The disputed domain name <tatainvest.com> is registered with GoDaddy.com, LLC (the “Registrar”). The Complaint was filed with the WIPO Arbitration and Mediation Center (the “Center”) on September 27, 2018. On September 27, 2018, the Center transmitted by email to the Registrar a request for registrar verification in connection with the disputed domain name. On September 28, 2018, the Registrar transmitted by email to the Center its verification response disclosing registrant and contact information for the disputed domain name which differed from the named Respondent and contact information in the Complaint. The Center sent an email communication to the Complainant on October 12, 2018, providing the registrant and contact information disclosed by the Registrar, and inviting the Complainant to submit an amendment to the Complaint. In response to a notification by the Center that the Complaint was administratively deficient, the Complainant filed an amended Complaint on October 16, 2018. In accordance with the Rules, paragraphs 2 and 4, the Center formally notified the Respondent of the Complaint, and the proceedings commenced on October 17, 2018. In accordance with the Rules, paragraph 5, the due date for Response was November 6, 2018. The Respondent did not submit any response. Accordingly, the Center notified the Respondent’s default on November 7, 2018. The Center appointed Ashwinie Kumar Bansal as the sole panelist in this matter on November 13, 2018. The Panel finds that it was properly constituted. The Panel has submitted the Statement of Acceptance and Declaration of Impartiality and Independence, as required by the Center to ensure compliance with the Rules, paragraph 7. The Complainant, Tata Sons Pvt. Ltd. established in the year 1917 as a body corporate, is the promoter and principal investment holding company of the Tata group of companies. The Tata group companies are acknowledged to be the standard bearers of excellence in quality and business ethics in India as well as abroad. The Complainant is the proprietor of the Trademark TATA by virtue of priority in adoption, long, continuous and extensive use and advertising, for example registered on June 7, 1969 in Singapore. The Complainant and its companies have exclusively used TATA as a trademark so that it is uniformly perceived as indicative of the source of the products and services. The Respondent registered the disputed domain name <tatainvest.com> on June 14, 2018 which consists of the Trademark TATA of the Complainant and resolves to a website offering financial management products and services, and other management products and services. The Complainant being the proprietor of the Trademark TATA holds exclusive rights in the said trademark and is entitled to take action against the unauthorized use thereof by third parties for any goods or services or in any other manner. The Complainant and other TATA group companies constitute one of India’s oldest and largest private-sector employer, consisting of over 100 major operating companies, 29 of which are listed on stock exchanges. The Complainant conglomerate has a combined market capitalization of about $144.79 billion (as on March 28, 2018) and a shareholder base of about 4 million. The Tata companies have employed over 690,000 people worldwide. The TATA name has been respected in India for over 149 years for its adherence to strong values and business ethics. The Complainant, its group of companies, its subsidiaries and other companies promoted by the Complainant have laid the foundation of the industrial core sectors, pioneering textiles, iron and steel, power, chemical, hotels and automobile industries in India. Keeping pace with the changing global scenario, have branched out into computers and computer software, electronics, telecommunications, financial services, mutual funds, tea, aviation, retail etc. Tata companies include Tata Steel, Tata Motors, Tata Consultancy Services (TCS), Tata Power, Tata Chemicals, Tata Global Beverages, Tata Teleservices, Titan, Tata Communications and Indian Hotels. In tandem with the increasing international footprint of the Complainant, its group companies, its subsidiaries, and other companies promoted by the Complainant, the Tata brand has also gained international recognition. The Complainant conglomerate brings to its customers worldwide a whole host of reputed brands. Brand Finance, a United Kingdom of Great Britain and Northern Ireland based consultancy firm, has valued the Complainant’s multi-brand portfolio at over $14.24 billion in 2018, declaring it the most valuable brand in India as on date. Since its inception in 1917, the Complainant has been continuously and consistently using the Trademark TATA, which is a name possessing the distinctiveness of an invented word, for its own business activities and those of companies promoted by it. The use of the Trademark TATA by the Complainant’s predecessors in business dates back to 1868. On account of its highly distinctive nature and pioneering activities of the founder, the name TATA has acquired an excellent reputation from the very beginning and down the decades, the said name has consistently been associated with and exclusively denotes the conglomeration of Tata companies, colloquially also referred to as the House of TATA, which are known for the high quality of products manufactured and/or services rendered under the Trademark TATA. The House of TATA consists of over 100 companies, which use the name TATA as a key and essential part of their corporate name. In addition, there are numerous overseas companies, philanthropic bodies and autonomous public institutions promoted by the House of TATA. The Complainant also has registrations for the Trademark TATA and various permutations and combinations therein in over 100 countries besides India including China. In addition to the common law rights that have accrued to the Complainant by virtue of the aforesaid facts, it is also the registered proprietor of several TATA formative trademarks in relation to various goods across various classes. The Complainant has devoted an enormous amount of time, effort and energy in promoting and advertising the Trademark TATA in print and online media and the said mark is consequently identified solely with the Complainant. As a result of the continuous and extensive use of the Complainant’s Trademark TATA over a long period of time spanning a wide geographical area coupled with extensive promotion and publicity, the said trademark enjoys an unparallel reputation and goodwill and has acquired the status of a well-known trademark globally. The Complainant, its group of companies, subsidiaries as well as the companies promoted by it are the Registrants of various domain names and websites containing the Trademark TATA. There are numerous orders by various Courts across the globe protecting and acknowledging the Trademark TATA of the Complainant. The Complainant has in the past successfully restrained other parties from using the Trademark TATA and other deceptively similar marks in relation to different and similar services by filing suits for interim injunction seeking reliefs, inter alia, for permanent injunction restraining infringement of its registered and well-known trademarks. The Respondent has registered the disputed domain name <tatainvest.com> thereby, misappropriating illegally and without authority the Trademark TATA, which is the exclusive property of the Complainant. The disputed domain name resolves to a website offering financial management products and services, and other management products and services to the customers. The Complainant itself is in the business of providing financial services and technical support through softwares, through its group companies, Tata Investment Corporation Limited and Tata Consultancy Services which were founded in the years 1937 and 1968 respectively. The disputed domain name is identical to the Complainant’s Trademark TATA. The disputed domain name <tatainvest.com> contains the Trademark TATA in which it has statutory and common law rights. The Complainant has the exclusive right to use the said trade and service marks both by virtue of it being the registered proprietor of the said mark in various classes across the globe as well as on the account of its long, continuous and uninterrupted use of the said mark solely as regards its goods and services. The Respondent does not have rights or legitimate interests in the disputed domain name. The Complainant has not licensed or otherwise permitted the Respondent to use its trademark. The Respondent registered the disputed domain name to make unjust gains. There could be no plausible explanation for the use of the disputed domain name by the Respondent. The disputed domain name <tatainvest.com> has been registered and is being used in bad faith and it is therefore a classic case of domain name squatting. The Respondent by using the Complainant’s well-known trademark thereby portraying to the general public that the Respondent is associated with or authorized by the Complainant. The Respondent did not file reply to the Complainant’s contentions. The Panel will address the three aspects of the Policy listed above. The Trademark TATA is derived from the surname of the founder of the Complainant namely Mr. Jamsetji Nusserwanji Tata. The Complainant is the proprietor of the Trademark TATA as per documents attached with the Complaint and it holds exclusive rights in the said trademark. 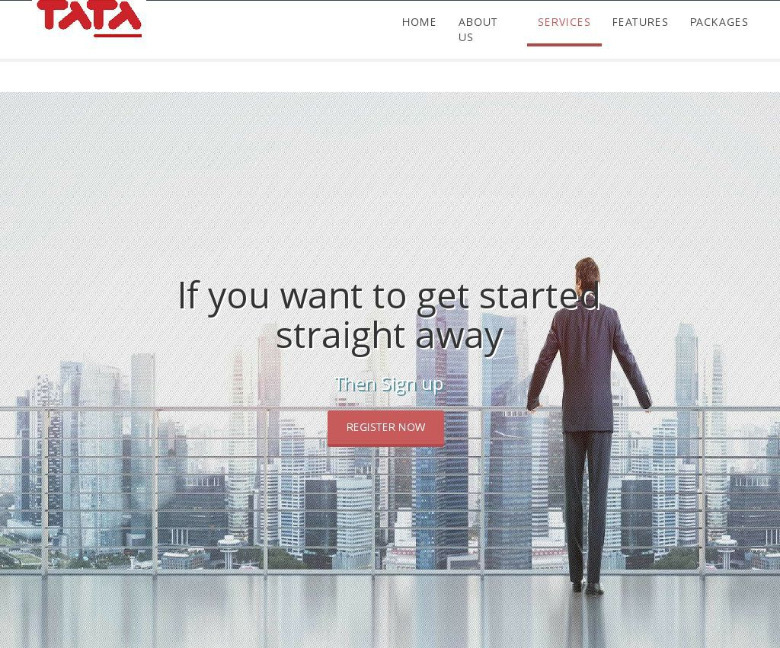 The disputed domain name <tatainvest.com> incorporates the Complainant’s Trademark TATA in its entirety, together with the word “invest”. The Complainant’s Trademark TATA is clearly recognizable in the disputed domain name, and the addition of “invest” does not serve to avoid a finding of confusing similarity. The generic Top-Level Domain “.com” may be disregarded for the purposes of comparison under this element. In consideration of the foregoing paragraph, the Panel finds that the disputed domain name <tatainvest.com> is confusingly similar to the Trademark TATA in which the Complainant has rights. Therefore, the Panel is satisfied that the first condition under the Policy is met. The Complainant has the burden of establishing that the Respondent has no rights or legitimate interests in the disputed domain name <tatainvest.com>. Nevertheless, it is well settled that the Complainant needs only to make out a prima facie case, after which the burden of production shifts to the Respondent who is required to rebut such prima facie case by demonstrating rights or legitimate interests in the disputed domain name. The Respondent has registered the disputed domain name consisting of the Trademark TATA of the Complainant and the word “invest”. The Complainant had been using the Trademark for a long time. The Complainant has not authorized or permitted the Respondent to use the Trademark TATA. The Respondent has failed to file a response to rebut the Complainant’s prima facie case or to advance any claim to rights or legitimate interests. The Respondent has thus failed to demonstrate any rights or legitimate interests in the disputed domain name as per paragraph 4(c) of the Policy. Based on the facts as stated above, the Panel finds that the Complainant has made out an unrebutted case. Accordingly, the Panel finds that the Respondent has no rights or legitimate interests in respect of the disputed domain name <tatainvest.com> in accordance with paragraph 4(a)(ii) of the Policy. Paragraph 4(b) of the Policy identifies, in particular but without limitation, four circumstances which, if found by the Panel to be present, shall be evidence of the registration and use of the disputed domain name in bad faith. Each of the four circumstances in paragraph 4(b) of the Policy, if found, is evidence of “registration and use of a domain name in bad faith”. The Complainant is required to prove both that the disputed domain name was registered in bad faith and that it is being used in bad faith. Hence, circumstances at the time of registration and thereafter have to be considered by the Panel. The disputed domain name resolves to a website offering financial management products and services, and other management products and services to the customers. Such use of the disputed domain name is bound to lead to confusion amongst the public particularly when the Complainant itself is involved in the similar business of providing financial services and technical support through software, through its group of companies. The Respondent neither is making a bona fide offering of goods or services nor a legitimate, noncommercial or fair use of the disputed domain name. The Respondent has registered the disputed domain name <tatainvest.com> incorporating in it the Trademark TATA of the Complainant. The Complainant has not granted the Respondent permission or a license of any kind to use its trademark and register the disputed domain name <tatainvest.com>. Such unauthorized registration by the Respondent suggests opportunistic bad faith. In view of these facts, use of the Trademark in the disputed domain name together with a term descriptive of the Complainant’s services is likely to cause confusion as to source, sponsorship, or affiliation of the disputed domain name, which constitutes bad faith registration and use under paragraph 4(b)(iv) of the Policy. The Respondent’s true purpose in registering and using the disputed domain name <tatainvest.com> which incorporates the entire Trademark of the Complainant is, in the Panel’s view, to capitalize on the reputation of the Trademark. The Panel therefore finds that the disputed domain name <tatainvest.com> has been registered and is being used by the Respondent in bad faith. For the foregoing reasons, in accordance with paragraphs 4(i) of the Policy and 15 of the Rules, the Panel orders that the disputed domain name <tatainvest.com> be transferred to the Complainant. 3 Men Movers #UDRP : We don’t need this harassment from you guys!